Outside of the Best-ofs, writer-about-town Chris Roberts penned another will-he-or-won't-he? piece on Ed Lee's potential run for a full term as mayor. Roberts points out the obvious a little bit: pretty much everyone else's chances will probably "turn to dust in an instant should Lee decide to enter the race." But the scariest part is the reminder that in a race with 35-some-odd candidates in it, we actually have like 10 frontrunners right now. That kind of defeats the purpose of having frontrunners, you know? In Arts and Entertainment Jonathan Curiel examines MoAD's Romare Bearden retrospective. Bearden should have been a household name forty years ago, but apparently all the museum folks in New York were racist back then. Now the artist, who shows influences of Picasso, Matisse and Diego Rivera, is getting the recognition he deserves. In drinking & entertainment news, apparently Chris Daly's Buck Tavern is "like a boring Cheers." Sorry, Chris. In Food, Kauffman checks out the Chinese charcuterie at Dong Bei Mama. The headline says it's "a trip through Manchuria," which the Richmond address seems to confirm so we won't dispute it. Sidenote: Did you download the Weekly's Best of San Francisco iPhone app? You should, because it's a lot easier than carrying a broadsheet around in your pocket all year and also it does twitter or something. Hannah Tepper put together a guide of all the summer festivals. Seven pages of celebrations, street fairs, art shows, galas, etc. so you have no excuse to be bored on the weekends this summer. If going outside isn't your thing or the June gloom inevitably gets you down, you might take a look at Cheryl Eddy's summer movie roundup. Eddy handily divides the summer flicks in to categories like "Superheroes!" or "Manmeat!" or "Indie Intrigue! ", so you ought to find something that interests you. It's not all summer fun at the Guardian though, the editorial team also takes a look at Gascón's inconsistencies when he was with the SFPD and this poor guy got fired for having a beard. Our favorite though: a review of local garage rocker Ty Segall's T. Rex cover record, "Ty Rex". 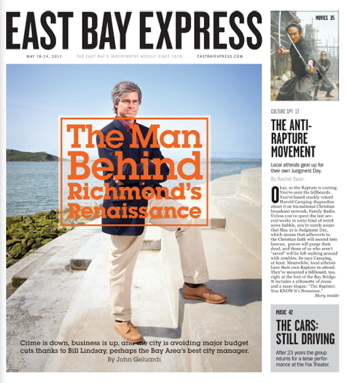 Finally, it's over to the East Bay where the Express takes a look at The Man Behind Richmond's Renaissance: one Bill Lindsay. He's responsible for bringing Galaxy Desserts (a five-time winner of Oprah's "favorite things" honor) to Richmond. In other food-related items, Luke Tsai gets a look at the much-anticipated Hawker Fare while Ellen Cushing plays with her food a Doof-a-Palooza. As far as hard-hitting items go, Robert Gammon's tries to figure out which county has the dirtiest cops: CoCo County or San Francisco. A useful read for some additional perspective on that whole Norman Wielsch/Chris Butler saga. And finally, we learn the atheists in the East Bay are preparing for the rapture in their own special ways.